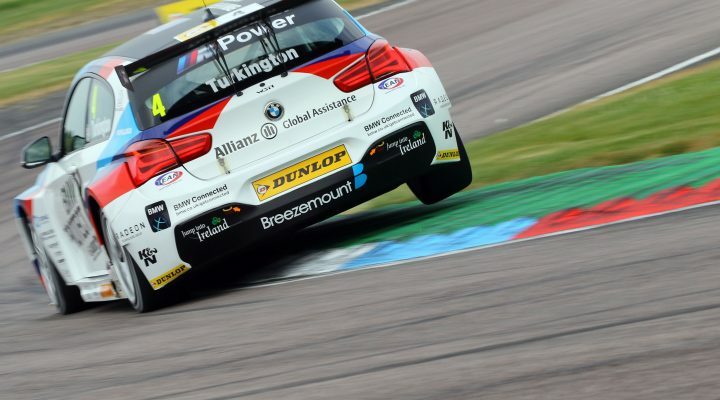 Colin Turkington has taken the 100th BTCC win for Bavarian marque BMW after producing a dominant lights-to-flag success in the final race at Thruxton. Turkington fittingly secured the century – having taken both of his BTCC titles in BMW machinery – with arguably one of the more straightforward victories in his illustrious career so far. The BMW 125i M Sport blasted away from pole position and was never in danger as the Ulsterman looked after his Dunlop SportMaxx tyres from start to finish. Squabbling behind involving Jack Goff, Tom Ingram, Rob Austin and Gordon Shedden made the task slightly easier for Turkington, who produced consistent lap after consistent lap, eventually taken the chequered flag nearly three seconds ahead of the chasing pack. It was championship leader Ingram that headed that pack, as the Speedworks Toyota man made moves by Goff’s Honda and Austin’s Toyota. Goff claimed a second podium of the day with his trio of top four results in Hampshire being just reward for the 26-year-old and his Eurotech Racing squad. Austin was demoted to fifth by Halfords Yuasa Racing’s Shedden, who keeps the pressure on Ingram at the top of the table. Adrian Flux Subaru Racing’s Ashley Sutton took seventh after making a great pass by Team BMW’s Rob Collard, whilst the inseparable Mercedes’ of Aiden Moffat and Adam Morgan were next up in the order. A special mention must go to race one winner Matt Neal, who started the final encounter from the back of the grid following steering problems in race two. The triple BTCC champ carved his way through the field and eventually took an incredible 11th place finish, behind the Vauxhall of Tom Chilton, who impressively set the fastest lap in the Power Maxed Racing Astra.